I'm a native Olympian who loves the process of creating art, it is cleansing to the soul. I have played with many mediums extensively, but I always return to Printmaking like it's a long lost friend. 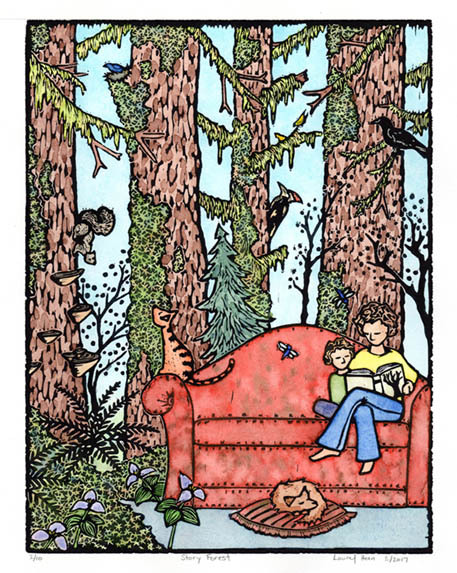 A good portion of my work is inspired by the nature within and around our Puget Sound region. The way we interact with nature has always intrigued me. We play with its forces, harnessing its powers for sports, beauty and livelihood. Whether it's being on the water or playing in the soils, we depend on nature for happiness and well being. I also draw inspiration from human relationships and the stories our lives tell. Whether we know it or not, every life, and relationship, has an intriguing story. Books unfold from our day to day lives and our communities, without being written. Incorporating books and stories into my art is something I return to again and again sometimes without even realizing I've done it.